Post subject: This place still active? It is a bit quiet, yep. Still visit every day when I'm at work to browse. Not had a Ford for about 6 years now. I pop in daily now as opposed to every few hours. Still got my XR2. Although I'm considering getting rid. Missus still has her 1.1. Still got the festival in the lock up. Still got the cortina too. But thinking of selling that too and get one car with the money from the sale of both. Not sure what. Nothing new though. Sadly Facebook and the like killed forums off years ago. I still come on every few days! All my XR2's are long gone unfortunately, do still have an XR4x4 I take for the occasional blast. 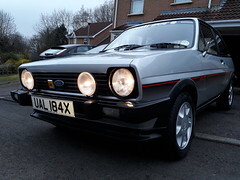 I've still got all of mine, 2 xr2s, 2 pop plus's and one L. 3 of them are in bits and 4 of the 5 are stored in a barn about 30 miles away from where I live, so progress is slow. Nowadays I couldnt even buy one for the price I paid for all of them. One of the XR2s cost me £45.00 (haggled down from £50) back in the day. I'm still keeping the candle burning in the window of XRTwo HQ. Still got mine, I live in the hope that folks will get fed up with face book. I've not even got an account ! I visit most day to check build threads. f*cking hell i can't believe i joined this site 14 years ago! I joined this site in 1999 I think. Wasn't there another forum before this one? pretty sure i joined before 2003 as well, I'm sure i remember another forum with a guy that had the user name "Ex Are two"
There's been a few versions of this one, the creativesell hosted one and then the munchio.dingojunction one before that and possibly one even earlier than that. I joined in 2000.